Last night at the Coliseo Ruben Rodriguez, WBO Minimumweight Champion Ivan "Iron Boy" Calderon remained undefeated after moving up to unseat WBO Light Flyweight Champion Hugo Fidel Cazares over 12 contentious rounds. Calderon was clearly at a size disadvantage from the start but used that to his advantage, avoiding most of the Mexican visitor's efforts early on and making Cazares pay with sizzling counters. But the energy Calderon expended while doing so began to tell on the native Puerto Rican as the pressure style of Cazares struck paydirt in the eighth, shaking "Iron Boy" with hard shots before flooring the minimumweight kingpin. Calderon beat the count but was on the defensive the rest of the way, with Cazares plowing ahead and scoring sporadically before himself tiring in the final two frames and taking some leather along the way. 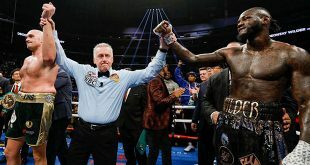 After the scores were tallied, Calderon was awarded the split decision victory on marks of 115-112 (twice) and 112-116. Cazares loses for the first time in 17 bouts. 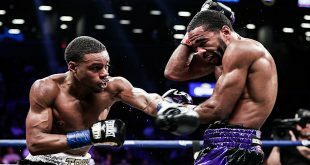 On the undercard, a titanic battle went on between local super feathers Roman "Rocky" Martinez, 17-0-1 (10), and Daniel Jimenez, 17-2-1 (10), with Martinez stopping his rival at 1:01 of the twelfth and final round to add Jimenez's WBO NABO belt to his own WBO Intercontinental crown. 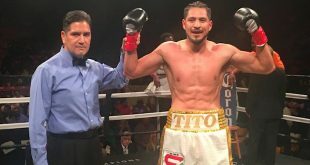 Mexican featherweight Edel Ruiz, 29-17-4 (20), climbed off the canvas in the second round and came through with his first meaningful victory in almost three years by stopping Dominican hot prospect Marcos "El Tigre" Leonardo at 2:51 of the fifth. Previous Irish Boxing: Dunne KO’d In First Round In Dublin!